Kappy and Miles at the white truck. Traveling grew monotonous after the stack. Kappy and Miles drove until the sun set, camped, ate, slept and drove again when it got light. It was strange, but Kappy seemed different to Miles, although he wasn’t entirely sure what had changed. She still didn’t speak much, but her bad mood had gone and at times she even seemed almost pleasant. Whatever it was didn’t last long, however, and around midmorning her expression was replaced with one of concern. She began climbing out of her tub and stomping back and forth across the road with her eyes closed, her forehead knitted in concentration. “Are you having trouble seeing?” asked Miles after the third time this happened. “How far away is that? I’ve only been there once,” said Miles. “How do you know the names of all these cities and towns if you live in the fields?” asked Miles, following her. If Kappy heard him she didn’t answer. Time stretched slowly by and the trees and fields blended together. Miles was absentmindedly watching Kappy as she sat on the edge of her tub when suddenly he saw her jump violently. “What happened?” he asked, laughing. “I’m not sure,” she said. She parked and got out, eyes closed. “Exploded?” asked Miles in shock. They continued on, neither voicing what was on both their minds, but each worrying that they might have followed a robot all this distance only to be rewarded with a chunk of melted metal. About an hour later they topped a hill and Kappy pointed towards the horizon. In the distance, far off on the road they were following, was a black smudge of smoke. “Is that it?” asked Miles. Miles looked at Kappy and she shrugged and started down the hill. The black cloud darkened and grew as they approached and they saw that the grass on one side of the road had caught fire. The wind was pulling the flames away towards the mountains. As they watched, the fire licked up a tree next to the road, consuming the dry leaves. Keeping an eye on the blaze in case the wind changed directions, Kappy and Miles made their way up the last stretch of road and arrived at the wreckage of the truck. The front of the vehicle was still mostly intact, although the roof of the cab had been torn off and the glass was shattered onto the road. The back of the truck was a blackened mess, however. A smoldering axle and the remains of a wheel lay some distance away. Debris was strewn everywhere. Kappy got out of her tub and walked quickly to the cab. The driver sat slumped against his steering wheel, eyes staring at nothing, but the passenger door was open and Kappy moved around the cab to examine the dirt of the road. “One of them survived,” she called to Miles. “He crawled off that way.” She pointed in the direction of the fire, where flames and smoke billowed up from the grass, moving across the field. “Can you see him?” asked Miles, walking over and looking towards the fire. Kappy shook her head and moved back to the smoking crater in the road. Kappy sniffed and examined the road, “I don’t think so,” she said at last. “It doesn’t seem right. This was some kind of explosive. Ammo maybe. 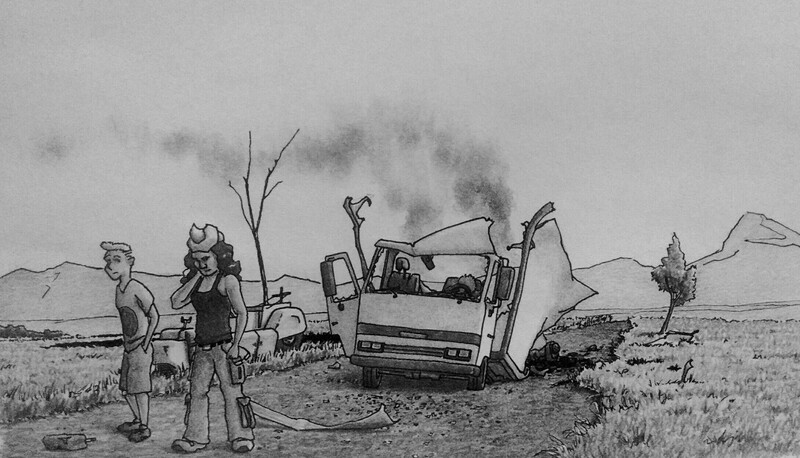 I don’t know.” She turned in a circle, looking at all the mess around them, everything that was left of the truck. She frowned and turned again. There was nothing but the remains of the truck. “Do you see any pieces of the robot?” she asked Miles. Kappy closed her eyes tightly. Then she smiled and turned slowly and raised her hand, pointing with one finger. “There!” she opened her eyes and stared out into the grass. Miles quickly got onto the tractor and followed Kappy as she plowed through the thick grass, bouncing over hidden rocks and mounds of dirt. They passed into the blanket of smoke and Miles could hear the roar of the flames as they consumed the grass. Miles coughed and covered his stinging eyes. He tried to shout Kappy’s name, but inhaled more smoke and the words were lost in a violent fit of coughing. He couldn’t see Kappy anymore or where he was going and he was suffocating, so he turned the tractor away from the noise of the fire and headed back towards the road. His lungs felt like they were filled with ash, but he finally made it to clearer air and looked behind him with watering eyes. Kappy was just emerging from the rolling black cloud a little ways away and she waved triumphantly when she saw him and pointed into the back of her tub. “You got him?” Miles tried to shout, but only got about half the words out before he had to start coughing again. He gave up on speaking and headed back to the road to wait for Kappy. Kappy climbed out of her tub and lifted the robot onto the road to have a look at him. “He looks fine!” said Miles in shock. “Not quite,” said Kappy crouching down behind the robot and holding it in place as it tried to roll away. There was a circular hole in the center of the robot’s back panel and the panel itself was charred. Kappy ran her finger around the hole. “What is that?” asked Miles coming over. Kappy didn’t say anything, but ran her hands up the panel, examining the rest of its surface. She looked up at Miles and grabbed his hand, pressing his fingers against the panel as well. “What am I feeling for?” asked Miles, trying his best to focus on the panel and not the fact that Kappy was holding his hand. “Are you sure?” asked Miles, eyeing the robot with mistrust. Kappy didn’t answer. She just crouched there, a happy expression on her face, watching the fire burn through the grass in the distance.